Build your health this this amazing collection of healthy and delicious recipes. Whether you are short of time or money, this epic of sheer knowledge will give you tips and instructions to make your body and soul perfectly sound and healthy. It tells to ways about to make a complete meal that contains nutritional value, minerals, enzymes as well as taste, that too easily and effortlessly. This handsome book enlightens the benefits of taking raw food as your diet continuously and why these raw foods features such a high nutritional value. 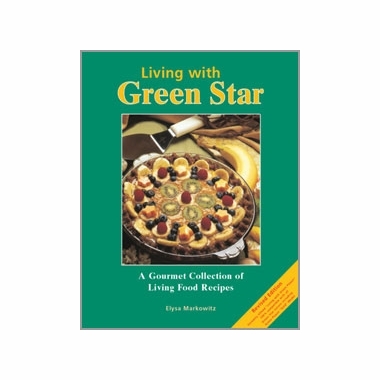 Living With Green Power | Green Star is an exciting user manual and recipe book by Elysa Markowitz. It offers you knowledge about health-friendly diet and nutrient rich food and ways to make your food enriched with vitamins, minerals, enzymes and energy to make your body stronger and mind sharper. It also tells you if you are not able to eat salads regularly then what you should prepare in compensation to the taste and nutritional value of salads. 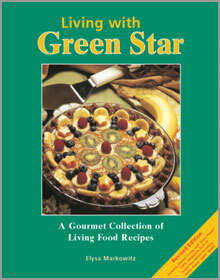 This recipe book explores the benefits and advantages of taking raw food as diet. It presents you with over 150 recipes ranging from Berry Red Juice to Picky Pecan Pie, with such a delicious taste and flavor that you easily adapt these diets with sheer confidence. Living With Green Power | Green Star offers you the chance to serve healthy and tasty meal to your family and friends like Creamy Basil Soup, Nutty Nut Patties, and Warmed Barley Bread. This highly knowledgeable book gives to complete education to make your health sound and good. It features clear instructions, recipe tips, and a photo gallery of raw food delights to explore the world of health and diet, while exploiting the world of delicious living foods.